New research from the Better Sleep Council finds that almost 75% of Americans feel that “mattresses are too expensive” in general. Yet over 90% agree that a good mattress is essential to good sleep, and the cost of poor sleep is well-established. Research from Harvard Medical School shows that lack of sleep costs the average U.S. worker $2,280 in lost productivity. Folks in Columbus are out to get the best bang for their buck. Shoppers here know the bottom-line value of a good night’s sleep, appreciate the importance of a decent mattress, and don’t want to pay a dollar more than they have to. Fortunately, the city has over 40 mattress retailers, all competing to offer the best prices in town. The great number of highly competitive mattress shops in Columbus is great news for consumers, who benefit from a buyer’s market. Folks who put in a little extra research, by tracking sales and comparison-shopping, can score an even better deal. If you’re wondering where to buy a mattress in Columbus, read on. 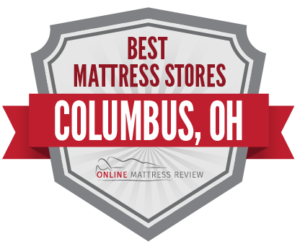 We’ve scoped out the reviews and listings for every mattress ship in Columbus to bring you the best of the best in each neighborhood. Read on to find out where to find the mattress of your dreams- at an affordable price- and get on the fast track to a good night’s sleep. You’ll find four mattress stores in Columbus in the University District, all within a one-mile radius. There’s Mattress Firm Lennox Station (1430 Olentangy River Rd), CBUS Mattress and Furniture (1475 Delashmut Ave), Original Mattress Factory (851 W 5th Ave), and Grandview Mattress (1288 Eastview Ave). Of these, the two independent and locally-owned Columbus mattress stores, CBUS Mattress and Grandview Mattress, garner the greatest numbers of five-star reviews on Yelp, Facebook and Google. Grandview Mattress (formerly known as SleepWell Columbus) has a basic, warehouse-style setup, and customers of praise the affordable prices and laid-back sales staff. The store sells bed frames, bunk beds and furniture as well, and is popular with university students. CBUS Mattress has a similar business model- a simple showroom and patient staff who provide plenty of information without pressure or up-selling. Just like Grandview, CBUS also sells bedding, bed frames, and other furniture as well. With multiple affordable mattress shops located close together, this is a great destination for university students to do a little comparison-shopping in search of a great bargain. Wondering where to buy a mattress in Columbus up in the northern area of the city? Head to Polaris. Here, you’ll find convenient comparison-shopping with a cluster of five mattress shops crammed into a matter of a few city blocks. There are two branches of the popular chain Mattress Firm in this area: Mattress Firm Polaris (1141 Polaris Pkwy) and Mattress Firm Fashion Place (8669 Lyra Dr). Original Mattress Factory (8747 Lyra Dr) is popular with shoppers for providing top quality products at affordable prices. This chain manufactures their own mattresses using high-performance materials and sells them directly to consumers, eliminating the middleman and passing on the savings. Sleep Number (1500 Polaris Pkwy), with its signature customizable beds, is a great option for shoppers in the market for an adjustable bed, especially those with sleep issue such as back pain or snoring. Sleep Outfitters (1516 Gemini Pl) carries top brands like Tempur-Pedic, Sterns & Foster, Sealy and Comfort Revolution, along with bedding and accessories. The staff guide customers through “sleep assessments” to fit them to mattresses that suit their sleep style and comfort preferences, without pushy sales tactics. A little to the East, shoppers can multi-task at IKEA (1900 Ikea Way), by purchasing furniture, housewares, and linens, along with an affordable mattress. This Swedish chain specializes in some-assembly-required furniture, but also has a good selection of mattresses, including traditional, foam and latex, at reasonable prices. Stop by the in-store lunch counter after browsing; the store serves meatballs, smoked salmon and other traditional Swedish treats. If you’re shopping for a mattress in Columbus to the South, you’ll likely be able to pick up other furniture in the same trip. That’s because the top mattress stores in South Columbus also sell appliances and furniture, and specialize in low prices. Appliance and Mattress Center (1941 Parsons Ave) sells highly affordable and locally-manufactured Solstice pillow top mattresses, along with regular and adjustable beds. Harmony Furniture Mattress (1967 Lockbourne Rd) sells wholesale Ashley furniture and Southerland mattresses, and customers appreciate their low prices. Bring bungee cords and prepare to tie down your new purchase, though- the store doe not offer delivery. Midwest Mattress and Furniture Outlet (3763 S High St) is a closeout, overstock clearance center. This no-frills mattress store earns great reviews from customers for its low prices as well. Here, the store is able to offer highly affordable mattresses by cutting the costs of staffing. The store is open by appointment only, and all products are priced 50-70% below retail. Mattress Firm Reynoldsberg West (8146 E Broad St). Customers of Columbus Mattress Wholesale (1953 Zettler Center Dr) love the store’s low prices, fast delivery and great customer service. The store is locally-owned and all Solstice mattresses in their inventory are made in Ohio. There are also two locations of The Mattress Firm in this area: Mattress Firm Sweetwater (1593 Hilliard Rome Rd) and Mattress Firm Clearance (1796 Hilliard Rome Rd). Mattress Firm is the nation’s leading mattress store, and sells brand-name spring, memory foam & adjustable mattresses. Knowledgeable staff and a wide selection at this chain earn loyal customers and solid reviews, and the Clearance store has especially good deals on closeout inventory. Similarly, Sleep Number (5043 Turtle Crossing Blvd) offers customers the reputation of a big-name store, along with the support of highly-trained sleep specialists. This outlet, located at the Mall at Turtle Crossing, is popular with customers seeking a specialty bed, such as an adjustable or hybrid mattress.